Talking today about the cruise missile 9М729, but first, a little history — the Treaty on the limitation of intermediate-range nuclear forces (INF) concluded between the USSR and the USA in 1987, under this agreement prohibited the development and deployment of ballistic and cruise missiles, ground-based range from 500 to 5,500 km. That is, the USSR and the USA have reduced on the INF Treaty whole classes of missile systems — ballistic short-range missiles (missile “Oka” and “Temp-s”), mobile ballistic missiles, medium-range (complexes RSD-10 pioneer / SS-20 and Pershing-2) and cruise missiles medium-range (Gryphon mobile systems with Tomahawk missiles, as well as its domestic equivalent — a complex of RC-55 "Relief" with missiles KB "Innovator", the same sea missiles "Granat"). The contract would last for several decades. Until March 5, 2013 in the United States have not published an article regarding known for his connections in the Pentagon columnist bill Gertz, who expressed the concern of the American side tests of Russia's newest ballistic missile the RS-26 Rubezh, which is supposedly in its capabilities as a formally ICBM (Intercontinental ballistic missile, a missile with a range over 5500 km) is actually a medium-range missile. The theme in General is murky and smells of innuendo from both sides. But there is a program to create a missile "Boundary" / "Rubezh-Avangard" came under sequestration and the complex "Frontier" left in peace. Cruise missile 9М728 / R-500 missile complex "Iskander-M" at the initial stage of the flight prior to the disclosure of the wing. Exercises "Vostok-2014". The Jewish Autonomous region, 20.09.2014 g.
While in the fall of 2015, several Western sources (including the said Gertz) began to Express concern about violations by Russia of the INF Treaty through the creation of new cruise missiles, which allegedly violates the terms of the Contract. And there has already been called and the index 9М729 and there were links to the sources including domestic official resources — the Ministry of defence and Institute of instrument engineering. Further, by the end of 2018, has the following picture of the charges: Russia allegedly created, tested and began deploying in combat units of the missile forces 9М729 cruise missiles with a range of more than 500 km of the Missile 9М729 from 2008 to the end of 2014 passed the test (including the State) and part of the missile battalions with 9П701 launchers and transport-charging machines 9Т256 on the chassis MZKT-7930-0000200 began to arrive in the missile brigades, armed with complexes 9K720 “Iskander-M”. Which, of course, is a flagrant violation of the INF Treaty, if the range of missiles do more than 500 km. In 2018, developed and less coherent argument our Ministry of foreign Affairs: Yes, there is such a missile, but the range of this missile is 500 km. 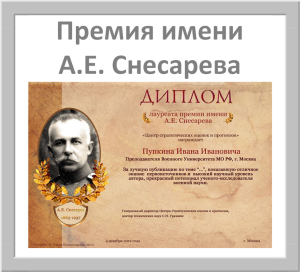 Then the truth is admitted that, well, Yes still in the first test starting it exceeded 500 km, but it happened purely by chance. In General, the normal “legal” rocket — further development of serial missile complex “Iskander-M” 9М728. What is the difference? The warhead is different and accuracy is higher. Well, do you violators — you have won themselves there this and that and generally “the whole back in chalk”. And by the end of 2018, the situation escalated and the Americans really started to prepare for withdrawal from the Treaty. And in this situation, the foreign Ministry and the defense Ministry decided to collect military attachés from different countries and show that the rocket intruder to debunk all the charges. 23 Jan 2019 was held in Moscow briefing of the Russian defense Ministry is dedicated to the rocket 9М729 and designed to put all points above “E”. About a deep understanding of the outcome of this briefing we will tell you more in the future. So far, only the facts. Self-propelled launcher missiles 9М729. The briefing of the Ministry of defense of Russia on 23 January 2019. First. Rocket 9М729 was not shown at the briefing. We saw the images, the launcher, models or real examples of vehicle launch containers, graphs, tables and all. Most missiles no one showed. Second. 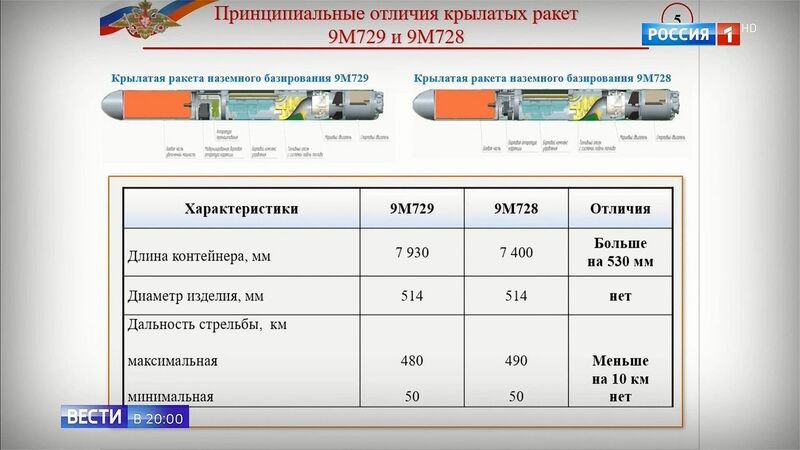 According to the posters and pictures 9М729 new rocket differs from a missile 9М728 the fact that she has a better warhead, slightly more than the length of the transport-launch container (TLC) — 7930 7400 mm instead of mm, shorter-range (480 miles vs 490 miles) and significantly more compartment with electronics. Questions then arise as to the circuit layout of the missile, whereby the compartments with a control system and adjustment is almost a third of the length of the missile, as if either is not true or inspire great fear for the level of development of our electronics. Imagine, a pipe diameter of 514 mm and a length of 2 meters is stuffed with electronic components with a few processors. This is what it could be? Could be the cooling system c of a certain CPU incredible processing power or the world's largest math coprocessor? The batteries then need only to start — in flight electronics is powered by a generator. In General, you can certainly justify anything, but these dimensions inspire. Schematic image of missiles 9М729 and 9М728. The briefing of the Ministry of defense of Russia on 23 January 2019. In General, it is not clear that there is 9М729 and what are its essential differences from 9М728 because what we see on the posters, to believe somehow difficult. But there is also an improved version of the rocket 9М729 which we learned about from the annual report Gosniip, which says that in 2014 it successfully completed the State tests of missiles 9М728 and 9М729 and its modifications. What kind of missile is not yet clear — perhaps the nuclear option 9М729. Third. New launcher, which was shown at the briefing was not new. 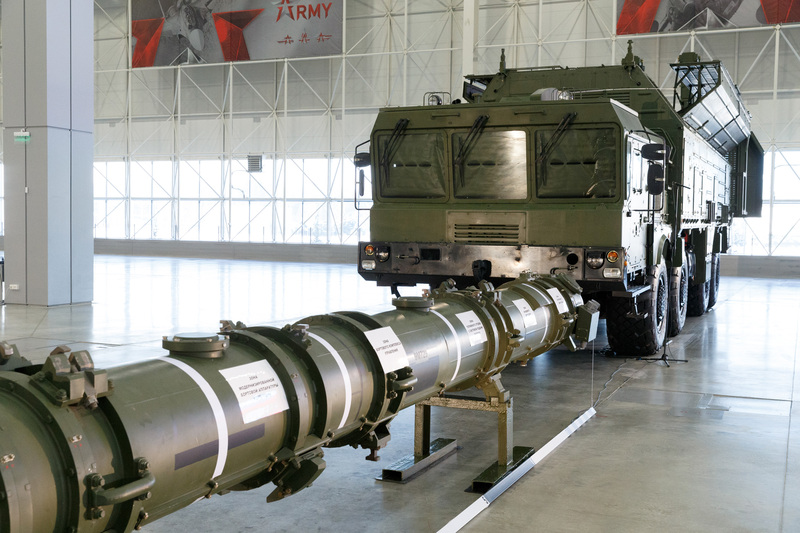 In 2007, at the naval show and the air show MAKS-2007 was a Premier installation for ground system with cruise missiles Kalibr / Club-M. was shown the installation is similar on “Iskander-M”, but with four containers with missiles. It happened in the year's first launch of a cruise missile 9М728 for the usual “Iskander-M”. 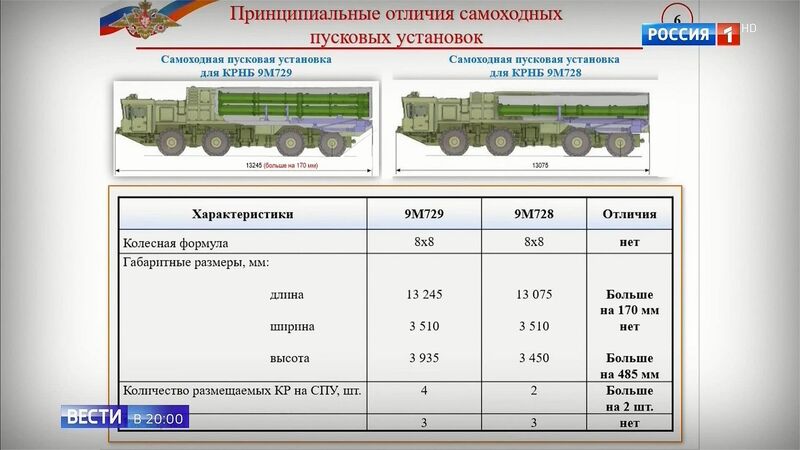 Visually, this prototype launcher almost identical to the setup that was shown at the briefing on 23 January, 2019 the index Plate on the installation, we have already known that for the production of some launchers 9П701 in quantities of one division per year (8 units) in 2016 and 2017 CDB “Titan”, Volgograd receives from Minsk chassis MZKT-7930. And for a new freight-loading machines 9Т256. These plants were associated with the new version of the missile complex “Iskander-M” missile 9М729 in 2017. Launcher missiles 9М729. The briefing of the Ministry of defense of Russia on 23 January 2019. Information on launchers and missiles 9М729 9М728. The briefing of the Ministry of defense of Russia on 23 January 2019. Fourth. 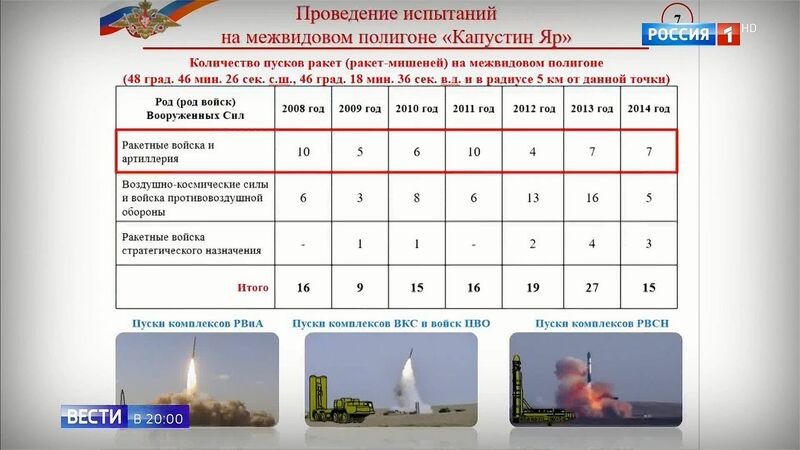 At the briefing we were shown data on missile launches from interspecific Kapustin Yar. With a caveat: in the radius of 5 km from the point with specific coordinates. 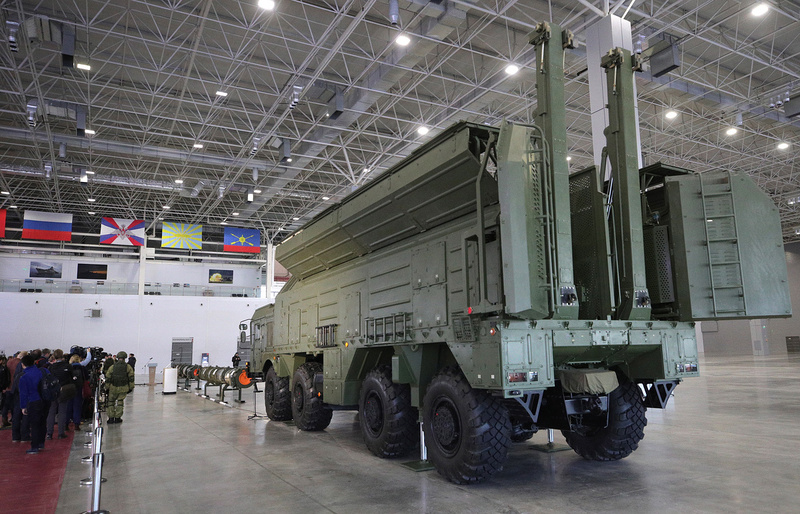 The point was on the ground air defense forces to the area 231 which was conducted test launches of rockets for complexes “Iskander-M” and their variants. What can we say on the label? In part, the strategic missile forces to the plate no questions — here are all the launches of Intercontinental ballistic missiles “Topol-e” and the RS-26 Rubezh is made from Kapustin Yar to Sary-Shagan. In terms of launch complexes, missile troops and artillery of the Russian ground forces, of course, have yet to understand, but in General there is a serious understanding of the objectives of the demonstration this plate I, for example, has not emerged. It proves nothing and disproves nothing, but the information is interesting, of course. Perhaps, then, all the launches and rocket 9М728 (except launches in 2007) and 9М729 missiles and ballistic missiles 9M723 complex “Iskander-M” and an improved version of the missile 9М729, which in 2014 have completed their State tests (see above). Information on space launches from Kapustin Yar. The briefing of the Ministry of defense of Russia on 23 January 2019. And what we have in the end? Clear position of the Ministry of foreign Affairs and the Ministry of defense of Russia: we have no violations, United States for themselves all agreed and came up with. To show any other evidence of our innocence seems so far no plans. 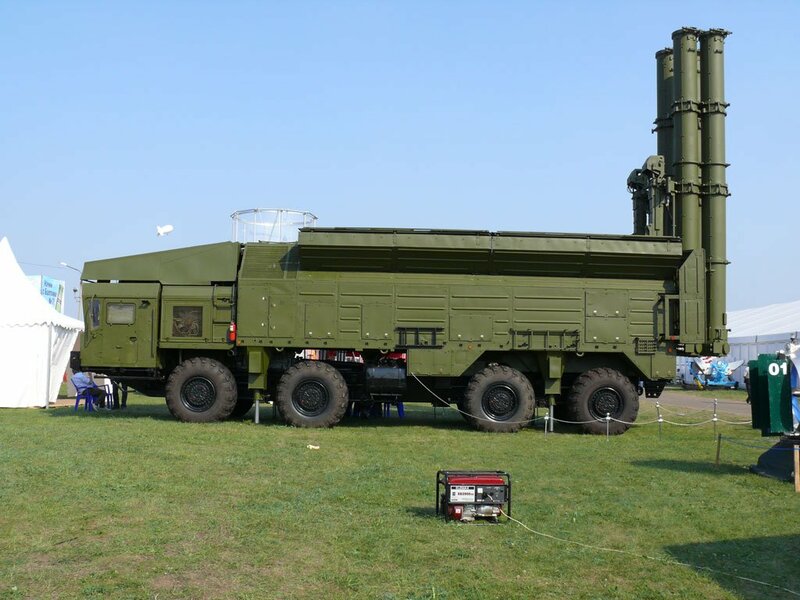 Rocket 9М729 really exists and it really is a somewhat elongated version of the missile 9М728. 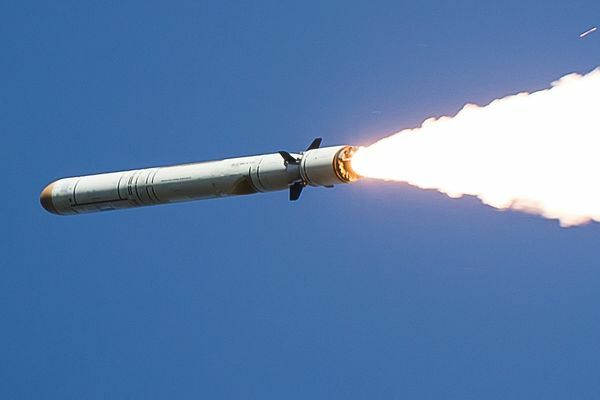 A little closer in dimension to a “big” sea rocket complex “Caliber” (in the complex “Caliber” several types of missiles significantly different from each other in size and in appearance and in purpose), which has a range of up to 2500 km. For good in our time such a missile (9М729) should be modular — as with the small-sized nuclear warhead would be logical part of the liberated volume of the crew compartment to take the fuel tank. Issues of alignment can be solved compensating cargo pumping fuel in flight and digital control system. But is rocket 9М729 modular or not — is unknown. And now, as it became known the day before yesterday, we have continued rocket news: we are waiting and “Suhorukova” “Caliber” and “landing”, “Zircon”. Ie many new and interesting for fans of rocket technology in the next few years. So all the real details on 9М729, I think, will gradually become known. Briefing the defense Ministry with a view 9М729 rocket complex "Iskander-M"